So, it's time to get a little personal. This is a super unglamorous post, so this is your heads up. Over the past few years my digestive health hasn't been the greatest, and this past year definitely hasn't been any better. As you all know I'm a fairly slim lady so when I would become bloated after every meal, it was super noticeable. After a simple breakfast my stomach would expand so much I would end up looking about 3 months pregnant! My body was definitely not looking like the one I recognized, and honestly it sucked. Besides it affecting how I looked, it was mainly having an effect on how I felt physically. I was in constant discomfort everyday and after every meal. I was also getting stomach pains on top of the discomfort. So, all around - not pleasant. 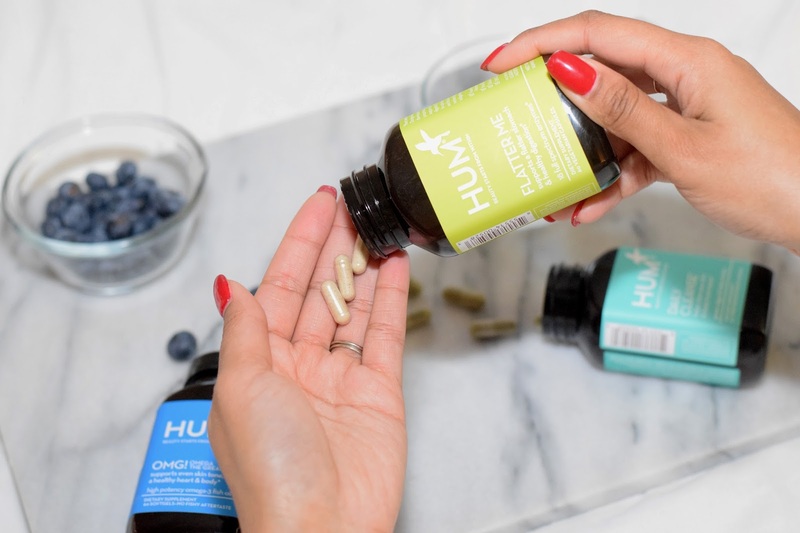 A little over a month ago the lovely people at HUM Nutrition reached out to me asking if I'd like to try out some of their vitamins, and of course said I yes! I'd totally been slacking on taking my vitamins so I thought maybe trying out a cool new company might get me back into the swing of things. I took their consultation that recommends which vitamins are best for you, and little did I know I was recommended a few for digestive health. A little while later I received my package with Flatter Me, OMG! Omega the Great, and Daily Cleanse. 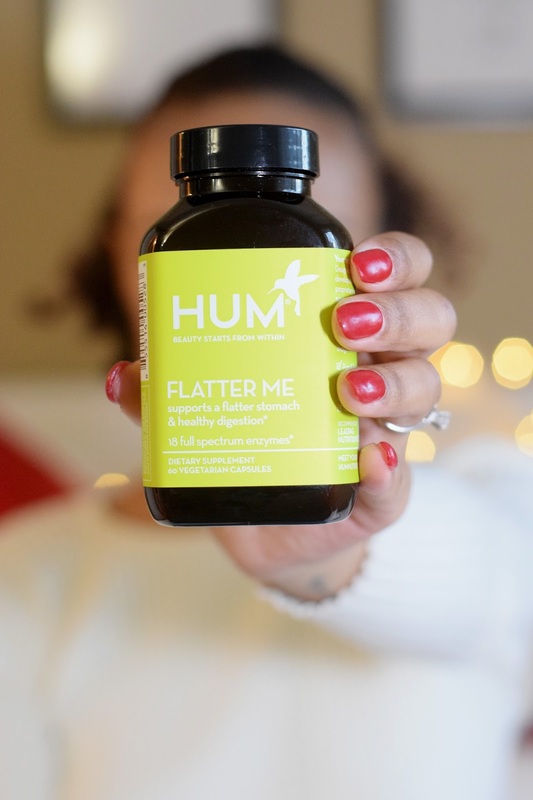 Flatter Me is a digestive enzyme for bloating. Daily Cleanse cleanses the skin, liver, bowel, kidneys, and lungs. OMG! Omega the Great supports and even skin tone, a healthy heart, brain, and body. I've been taking these pills for 30 days now, and they have been working great. I barely get bloated anymore, and I've been way more regular (if you know what I mean). But, these vitamins are not the only thing I attribute to my newfound improved digestive health. Let's chat about my diet change. Around the same time I began taking the HUM vitamins, I saw my doctor for my stomach issues. She told me to try out a low FODMAP diet to see what exactly is causing all of my problems. It's a six-week diet where you basically stop eating all of the foods in the FODMAP list, and after six weeks slowly reintroduce the foods back into your diet to see exactly what is causing the problems. I started this diet on November 12th and I'll be finished with it December 23rd. After December 23rd, I'll slowly begin reintroducing the foods on the list back into my diet. 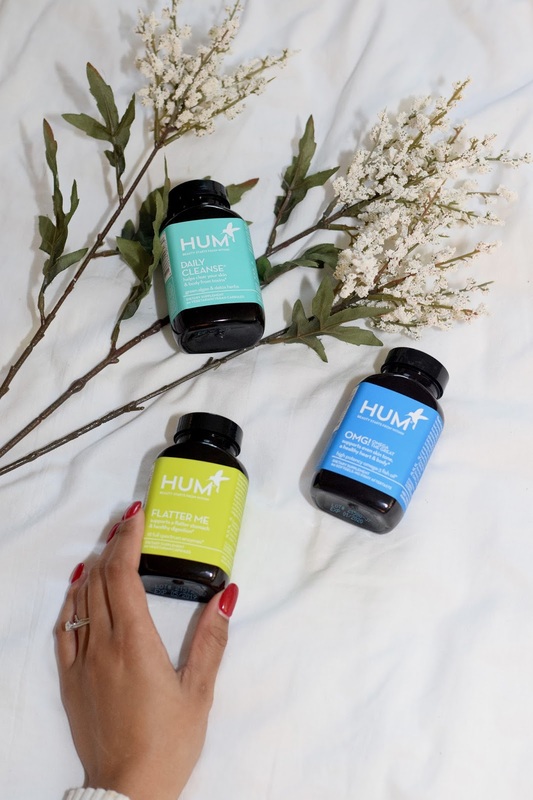 *I was sent these products to try from Hum Nutrition, but all opinions are my own!